In 1874 George Seatree and Stanley Martin made the first ascent of North Climb, which was the first time the main face of Scafell had been ascended outside of the obvious gully lines. It was the start of great things on the crags of Scafell. Upon hearing their report of this new route, Will Ritson, landlord of the Huntsman's Inn, looked at them incredulously, and declared in his usual broad Cumbrian dialect... "Nowt but a fleein' thing could git up't crags on't Wasdale Head side". This book covers the full 200 year history of climbing on the crags of Scafell in both summer and winter conditions, in an extensive and comprehensive manner. Every route on the crag has been noted with the significant ascents being described in detail, and the entire book has been comprehensively illustrated by photographs from archive and newly commissioned work. A significant proportion of the source material has come from recordings made of the pioneers of these climbs that has never been published before. There is also an intricate explanation of the geological features which go to make up these crags as well as new maps and crag diagrams together with notes on conditions, biographies of past climbers and a comprehensive first ascent list that combines both summer and winter climbing for the first time. 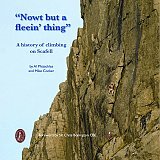 This book has been produced by members of the Fell and Rock Climbing Club and it is one of the most detailed compilations of rock climbing history to a single mountain crag in Britain.